Soils for containers need to be well aerated and well drained while still being able to retain enough moisture for plant growth. When choosing what to use to fill containers, never use garden soil by itself no matter how good it looks or how well things grow in it out in the garden. When put into a container both drainage and aeration are severely impeded, and the results are that plants grow poorly or not at all. 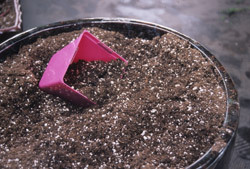 Soils for containers are always modified in some way to ensure proper drainage and aeration. Container soils are often referred to as soilless or artificial media, because they contain no soil at all. They are often composed of various things such as peat, vermiculite, bark, coir fiber (ground coconut hulls) in a variety of recipes depending on the manufacture and the type of plant material being grown. They can be found under a variety of trade names and in sizes ranging from a few quarts to bales that are many cubic feet in size. Sometimes the choice of media will be directed by what type of plants you are growing. Succulents, herbs, and perennials tend to prefer soils that are well drained and not retaining a lot of moisture over a long period of time. For them you might choose media that are courser in texture containing more bark, perlite or sand. For tropicals and foliage plants, you might choose a media with more peat and less course material as these plants tend to prefer moisture growing conditions. When these mixes are used, they should be moistened slightly before planting. Fill a tub with the media, add water and lightly fluff the media to dampen it. This media has advantages and disadvantages. The disadvantage is that the soil you are using may contain insects, weed seeds and disease organisms. Soilless medias are generally free of these things. Soil based medias are heavier. This may be an advantage though especially if the containers are used in a very windy location and the extra weight will help keep the pot upright. Soil-based medias are also a bit more forgiving when it comes to water and fertility. They tend not to dry out as fast, and they also tend to hold on to nutrients longer. 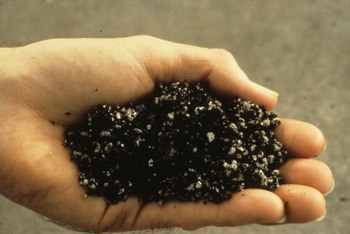 Because soilless medias can be a bit more costly, you could mix 25 percent soil with the soilless media to stretch your soilless media for a few more pots. Also, can soilless media be reused from year to year? To a certain extent, yes. If the plants in the containers were healthy during the growing season with no major disease issues, you could remove the plant material at the end of the season and reuse the media next season. You may have to add some additional new media to fill the container. There will come a time when the media in the container will need to be replaced. Over the course of time, the organic materials that the soilless media is made from break down and decompose to the point where you will loose the drainage and aeration properties that are inherent in soilless container medias. When that happens, discard the media to the compost pile or to the garden and refill the container with fresh media. There are also bagged products labeled as top soil that tend to be largely sedge peat. While they are inexpensive and look very good, once put into a pot they are poorly drained and poorly aerated. They can be used in combination with soilless media products or amended much the same way as if you were using garden soil. When filling containers with media, don't fill the pot to the top. Leave about a one inch space between the top of the soil and rim of the pot. This will help make watering the pot easier as it provides a place to "put water" and not have it run over the edge. Filling very large containers can be costly especially when using commercially prepared media. To reduce the cost and also the weight of the container consider adding "filler" to the bottom of the container to take up space. Many things can be used, but they should be something that is inert, able to take up space and not break down over the course of the growing season. While there are inserts made for this purpose, there are a lot of home products that can be recycled for this use.